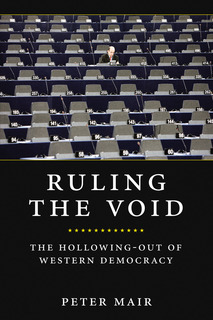 Earlier this year I read the late Peter Mair‘s Ruling the Void: The Hollowing of Western Democracy. It got me thinking, because as I observed in Chapter 5 of No Straight Lines, we are in a process of political transformation. A transformation of how we organise and run our societies. I ask the question, what should government look like in a non-linear world? Are we creating and running systems in the right way? Why is it that so many people are disengaged with the process of democracy and civil organisations? And I was lucky enough to engage with this topic in Scotland at the end of last year. It is for these reasons I found Mair’s work so intriguing. He writes, The age of party democracy has passed. Although the parties themselves remain, they have become so disconnected from the wider society, and pursue a form of competition that is so lacking in meaning, that they no longer seem capable of sustaining democracy in its present form. Decoupling from parties and people that make society: This process of disengagement began with genuinely good intentions argues Jan-Werner Müller, the purpose of European integration was from the start to create a ‘protected sphere’ – protected, that is, from the vagaries of representative democracy, (John Keane argues we now live in an age of monitory democracy – where we have no choice but to monitor the politicians). After the political catastrophes of the mid-20th century, Western European elites (except in Britain) concluded that popular sovereignty should be treated with deep distrust (the root of Euro-sceptics). After all, how could one have any faith in the people when the people had allowed the terrible destructive power of Facism to rip Europe and the wider world asunder. There were profound reservations even about the idea of parliamentary sovereignty because had not legitimate representative assemblies handed power over to Hitler in 1933 and to Marshal Pétain in 1940? As a result, parliaments in postwar Europe were weakened systematically, while non-elected institutions – constitutional courts are the prime example – were given more power. When power becomes more important than accountability: when power becomes large scale, autonomous and unaccountable, it will suffer its preordained fate; moral, financial and spiritual corruption. Subsequently it is the political class as a whole that become a matter of debate and contention in many parts of Europe. As politics has become professionalised becoming even a ‘dynastic right’ on both sides of the political divide – it has over time, emptied itself of meaning and therefore context. The “general public” has therefore turned away, disinterested and disillusioned as nothing changes for them and the language politicians use are less the vernacular of the everyday and more management speak learnt at MBA school. Whilst an elite ruling class has stepped in to best manage things. As the void opens up others step in: our current context of economic and social turmoil is the humus in which more in extremis ideologies take hold. Step in for example, the Party of Freedom (Partij voor de Vrijheid, PVV) Holland, Northern League (Lega Nord) Italy, Swiss People’s Party (Schweizerische Volkspartei – SVP), Denmark People’s Party (Dansk Folkeparti, DF), Freedom Party of Austria (FPÖ) and Alliance for the Future of Austria (BZÖ), Progress Party (Framstegspartiet, FrP) Norway, Sweden Democrats (Sverigedemokraterna, SD), the True Finns in Finland, Golden Dawn in Greece, the Front National in France. All are far right organisations throughout Europe. Is there not something wrong when we see ourselves as being ruled by unaccountable, supposedly apolitical experts, but the only prospect of rescue is afforded by populists who promise to hand power back to the people? The former give us identical policies everywhere and no politics; the latter, you might say, give us politics and no policies. Media loves a vaccuum: Media also takes up the slack and its red blooded pursuit of readers and sales contributes as well to recreating our body politic. No wonder UKip has become a “contender” in the UK – someone has to fill the void. UKip leader Nigel Farage hanging around in an English pub, with a classic pint glass in his sticky mit, sells newspapers – he could be a character from a JG Ballard novel. Media happily fills the void with fear and feasts on its consequences. The end of the line for linear politics: Mair describes a large scale European wide system failure. And is a warning siren those who naively consider modern political parties to be a vehicle for transforming the aspirations of the wider of the community into reality. Jan-Werner Müller neatly summarises Mair’s conclusion that the EU is a house that party politicians built with bizarrely no room for politics, while national governments increasingly protest they are merely the branch office of Brussels (The UK a prime example). After all, says Müller, if Brussels has already decided, you don’t take the blame; never mind that you were there at the negotiating table. In this situation, what Mair calls the Tocqueville syndrome becomes acute: if political elites are either inaccessible or impotent, why put up with them? Tocqueville was writing about the fall of the aristocrats in the Ancien Régime, who could no longer justify their privileges once they had lost power to a centralised monarchy. The worst of the economic crisis might be over, but the political crisis in Europe is only just beginning. When institutions fail people learn to get what they need from each other: What comes next will be unprecedented – as louder and more urgent calls come from people wanting to manage their own destinies at an increasingly, regional and local level – where accountability can be properly and judiciously exercised. Ecuador is exploring an entirely different model of economics and society, Scotland even outside the independence vote has a real appetite for real change – for example of creating a Rural parliament (based upon a wider study), a human operating system designed to empower rural communities and give them a greater opportunity to influence decision-making, network and share expertise (Scottish Rural parliament website). So how do you rule the void once the party’s over? Well it looks like a more nuanced and people centric way of governing comes into play – and it will if our current political institutions continually fail to deliver.